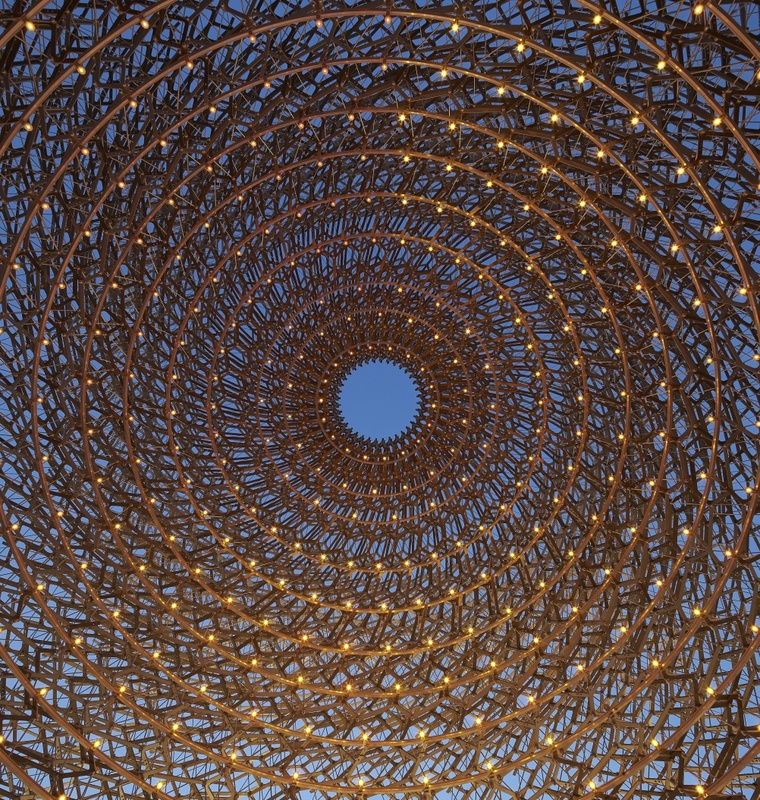 Selected to create the UK pavilion at the Milan Expo this summer, Nottingham-based artist Wolfgang Buttress talks us through the experience of his interactive beehive, where “no two moments are the same”. Design Week: Why did you decide to focus on the role of the honeybee in your project? 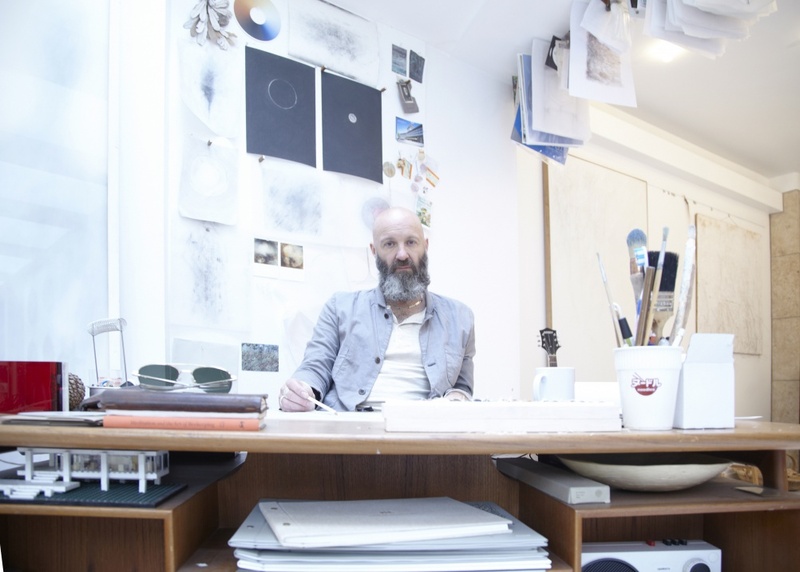 Wolfgang Buttress: This focus is a response to the Expo theme [which is “Feeding the planet: energy for life”]. I wanted to find a simple metaphor for the state of the planet in 2015 – bees are very sensitive to their environment, so can be seen as ecological sentinels. The role of ecosystems in our food chain is very significant, but often overlooked in favour of a more anthropocentric emphasis, as if human beings somehow operate in a vacuum, distinct from the rest of the biosphere! Pollination is essential, underwriting much of our food production. Yet the bee is in crisis, threatened by pesticides and monoculture. I wanted to highlight the significance of this for food security. DW: How did you develop the concept for the interactive beehive? WB: We got in touch with bee expert Dr. Martin Bencsik who is doing some amazing research. By measuring vibration signals he can pick up certain bee communication messages and predict swarming, which is a significant step in progressing our understanding. Our concept for the Pavilion came out of this collaboration. As a sculptural piece, the Hive draws on my previous work and explorations, but extends these into new territory. DW: What is the purpose of Hive? 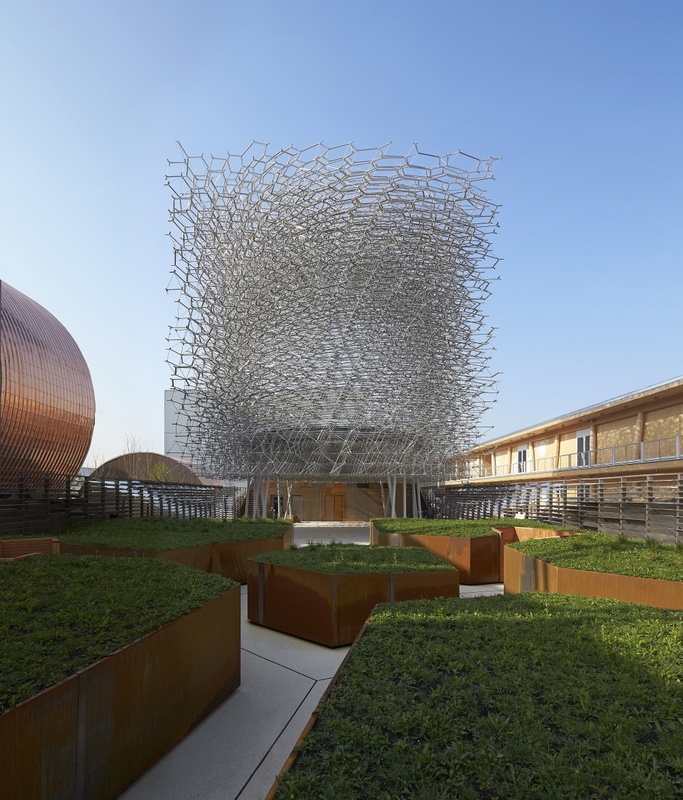 WB: Our central idea was to employ Dr Bencsik’s research techniques to connect a real beehive in the UK to our Pavilion in Milan. Digital signals from a bee colony are streamed in real-time and expressed to visitors through light and sound. In short, the purpose is to engage the visitor on an emotional, experiential level, while showcasing something of the possibilities afforded by Martin’s research. The overall objective of the Pavilion is to highlight the plight of the bee, so it comprises relevant and important landscape typologies. There’s an informational component embedded into the design too. DW: What will visitors experience as they walk through it? WB: It’s about being in the moment. At each instance the experience is unique and changing. The lighting array and 7.1 surround sound system respond in real-time to live-streamed signals from a bee colony in Nottingham, UK, so no two moments are the same. The Hive acts as a medium or interface, communicating the activity of bees directly to the visitor at that specific point in time. The hive is an open lattice structure, so creates a sense of enclosure but is also open, letting in the surroundings – there’s an ambiguity. DW: What technologies are incorporated into Hive and how do they work? WB: The vibrational activity of the living bee colony (to which the pavilion responds) is measured using accelerometers. The high-dimensional data signals from these sensors are analysed and decoded using a Fourier spectra averaged on different time scales. These distilled signals are expressed via an array of individually-addressable LEDs. In addition, there’s an audio dimension to the experience, implemented using a surround-sound system. We’ve composed a soundscape based on pre-recorded harmonious stems, triggered at particular thresholds and noise-gates within the live-streamed bee-signals. It’s a kind of collaboration and symphony between bee and human. There’s also a “swarm wall” in the entrance/orchard area, which exhibits an informational animation about the bee, on an array of small screens embedded into the wall. DW: How do you think Hive draws parallels with a human society? WB: Certain parallels are interesting: cooperation, the architectural impulse, an affinity for the beauty of flowers. The use of parallels was mainly a play on scale. We’ve raised the meadow to eye-level in places, to give a kind of “bee’s-eye view’ perspective. 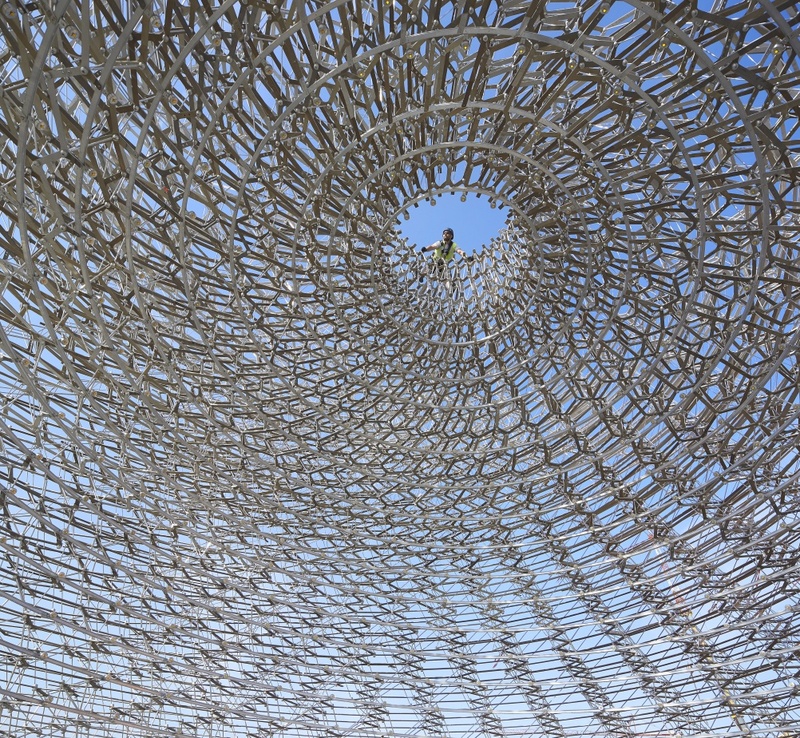 The Hive provides an immersive experience based on the energy within a real bee colony. I wanted the visitor to empathise – you can only take this so far though! DW: How does the structure shed light on and show solutions for global environmental issues? WB: We’ve focused on the importance of better understanding our environment. The design draws inspiration from cutting-edge research, which could aid and simplify the process of bee-keeping through development of new monitoring technology. This in turn could form part of a wider strategy to ensure the survival of the bee, a species upon which our food chain depends heavily. A clear and holistic understanding is the first step to formulating effective solutions. There are also elements which the visitor must discover, such as hidden screens and messages. I believe things are more impactful if people find them out for themselves as there’s a mystery and playfulness to it. Additionally, around 60 per cent of our site is planted and landscaped. On a small-scale level, our wildflower meadow is providing an oasis of habitat within the expo site, and serves as an implementation of biodiversity within an urban environment. DW: In what ways do you think designs such as this can help to tackle these issues? WB: The environmental and economic problems facing humanity are varied and significant. The scope of a pavilion in this context is necessarily limited. In this case we’ve selected the decline of the bee, which is a particularly compelling and relatable example of a wider problem. The Pavilion’s main function is awareness, to send out ripples. The key messages are the importance of biodiversity, and of our co-dependence with other ecosystems. If people take these messages to heart; if people learn something new, discover insight; if people come away inspired or otherwise motivated to act, to change, or to find out more; then the Pavilion will have achieved something towards this wider objective. Visual of UK Pavilion Milan Expo 2015 by day. DW: Why do you think the honeycomb lattice structure makes for a good art installation? WB: I’m interested in the forms and geometry in nature. There are certain qualities to this lattice structure that are significant beyond the fact that it’s based on honeycomb. I’ve been exploring themes of delicacy and ephemerality in my art for the past few decades. The Hive evolved through many iterations of design, guided by our chosen angle and underlying theme, and through a unique multi-disciplinary collaboration. The design was very process-focused in that way. 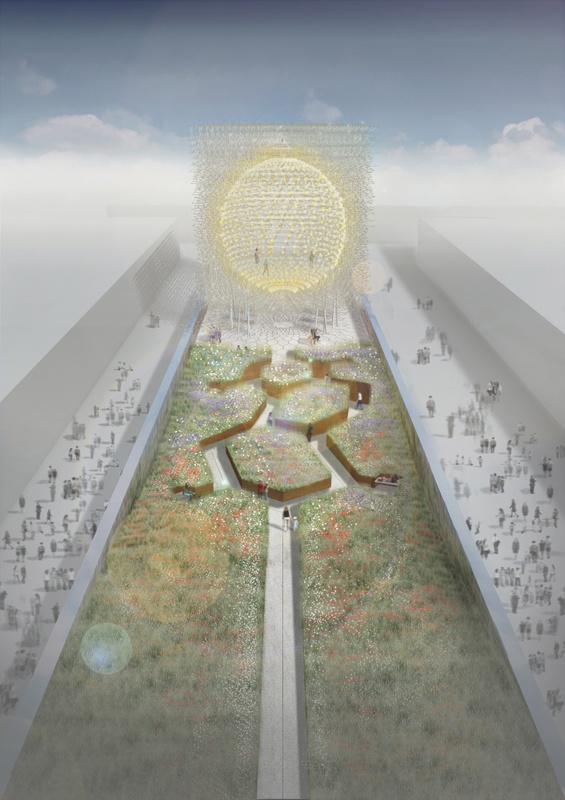 DW: How will Hive stand out from the other countries’ installations at the Expo? WB: The overall vision for this Pavilion comes from an artist’s sensibility rather than an architectural one, and as a consequence, is conceived more as an experience than a building. We wanted to connect the visitor with nature and ecosystems on an experiential level. DW: Why do you think temporary structures such as this are important? WB: If you take a really long-term view, all human structures have a lifespan, a certain temporality. The Expo has a particular time-scale: six months. We’ve designed the Hive as a kit of parts so that it may be dismantled and re-assembled elsewhere. The intention is for it to have a second life after the event, a more permanent home. Long-term thinking is an important paradigm shift we must undergo as a species if we are to tackle present environmental and economic challenges. So perhaps this also works at the level of metaphor. The Milan Expo 2015 takes place in Milan, Italy from 1 May – 31 October 2015.